Sewage sludge — a byproduct of wastewater treatment and domestic sewage — mainly contains organic matter dense in nutrients like phosphorus (P) and nitrogen (N), and hence, it can be used for replenishing farmlands of depleted soil. Sludge has a tendency to concentrate harmful constituents, including heavy metals, present in wastewater because of the nature of the physicochemical process involved in the treatment of wastewater. Governmental regulations like the EPA Part 503 of the United States and the Sludge Directive 86/278/EEC of the European Union restrict the heavy metals content of sewage sludge. Concentrations of around 10 heavy metals, like As, Cr, Cd, Cu, Pb, Hg, Mo, Ni, Se, and Zn, are usually monitored in sewage sludge. If maximum permissible concentrations are not fulfilled, then incineration is predominantly used to dispose of sludge. Heavy elements present in sewage sludge can be suitably determined through energy-dispersive X-ray fluorescence (EDXRF), which depends on a highly sensitive detector to quantify the emission lines of all elements, right from sodium (Na, Z = 11) to uranium (U, Z = 92) at a few ppm to % w/w concentrations. Since sample preparation is minimal, a complete sample analysis can be done within 15 minutes. The Thermo Scientific™ ARL™ QUANT’X EDXRF spectrometer is integrated with a 50 W Rh target X-ray tube, which is air-cooled with the highest excitation voltage of 50 kV, and also with a silicon drift detector (SDD). To improve the peak-to-background signals for all elements ranging from Na to U, a set of nine primary beam filters has been developed. 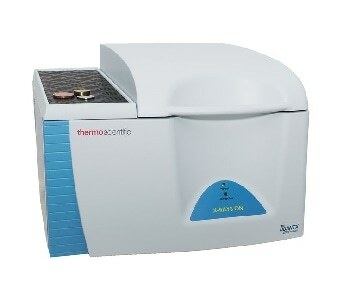 The 10 position auto-sampler equipped with a spinner enables unattended analysis of various samples. For all energy-dispersive detectors, the SDD continues to be the performance benchmark. With its large active area of 30 mm2, the characteristic element X-rays discharged by the sample can be effectively captured. In EDXRF, both precision and sensitivity are obtained through targeted excitation of the sample to fluoresce only the required elements. For optimal background control, the ARL QUANT’X EDXRF spectrometer offers an almost limitless combination of excitation voltages (4–50 kV) as well as numerous primary beam filters. As illustrated in Table 1, seven spectra were acquired from individual sludge samples for a total live time of 6 minutes, which corresponds to less than 12 minutes in real time (including the detector dead time). Heavy metal concentrations in sludge are typically expressed as mg/kg (ppm) of dry matter. For sample preparation, dry sludge is ground in a mill to create less than 50 µm particles (325 mesh) so that the effects of particle size are minimized as much as possible. Although it is possible to analyze the powder directly, sample-to-sample repeatability and accuracy are enhanced by pelletizing the powder either with or without a binding agent through a manual press at 15 tons. Quantitative analysis of these sewage sludge samples was made using the fundamental parameters (FP) approach. Calibration of the FP model was made with the help of 20 pure compound/element standards collected from the standard element kit provided for quantitative analysis; the kit is optionally available with the ARL QUANT’X EDXRF spectrometer and includes all the required elements to cover the entire periodic table. Sewage sludge consists of a considerable organic matrix fraction (around 65% w/w), which does not produce any characteristic signals in the spectrum. The unknown matrix has to be defined as part of the FP analysis routine. For standard sludge samples, the organic fraction is suitably characterized by cellulose (C6H10O5). To validate the calibration, four sewage sludge reference materials — BCR 144R, BCR 145R, BCR 146R, and NIST 2781 — were utilized as “unknowns.” These reference materials were, in fact, sewage sludge samples of both industrial and domestic origin. The analysis results for these reference materials are shown in Table 2. As indicated by these results, a rapid and simple FP calibration using pure element standards provides results that are usually accurate within 5%–10% relative. Results can be further enhanced through extra work using type standards for more precise calibration. Therefore, the ARL QUANT’X EDXRF spectrometer acts as an excellent tool for screening sewage sludge samples. Standard reference material NIST 2781 was used to derive the detection limits for these samples. Detection limits largely rely on the presence of any intrusive elements at comparatively high concentrations and the type of sample matrix. The typical detection limits for this type of samples are shown in Table 3. Detection limits of a few ppm can be achieved for all elements, with certain exceptions. The extremely low detection limits for heavy elements like cadmium (Cd) and molybdenum (Mo) are of major interest. The ARL QUANT’X EDXRF Spectrometer serves as an excellent tool for screening and monitoring the heavy element content of sewage sludge. A simple and easy calibration using pure element compounds and fundamental parameters provides a fast semi-quantitative analysis technique that involves very little sample preparation. Excellent element sensitivities are also allowed by the SDD.